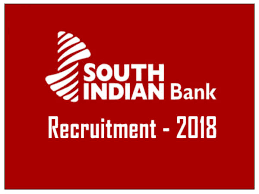 Brief Information’s: South Indian Bank has published notification for the recruitment of Probationary Officer. Those Candidates who are interested in the vacancy details & completed all eligibility criteria can read the Notification & Apply Online. Sout Indian Bank Selection Process: Online Test, Group Discussion and Personal Interview • Initial Short listing will be done based on the online test marks. • Final Selection will be based on the consolidated marks obtained for online test, GD and Personal Interview. • Bank reserves the right to make required modifications in the selection process considering the number of applications for the post. Candidates can apply online only from 20.06.2018 to 27.06.2018 and no other mode of application will be accepted.